New trains on the San Martin line arriving at Hurlingham station, Buenos Aires, Argentina. They have had to raise the platforms to accommodate them . The slide doors are a lot safer. 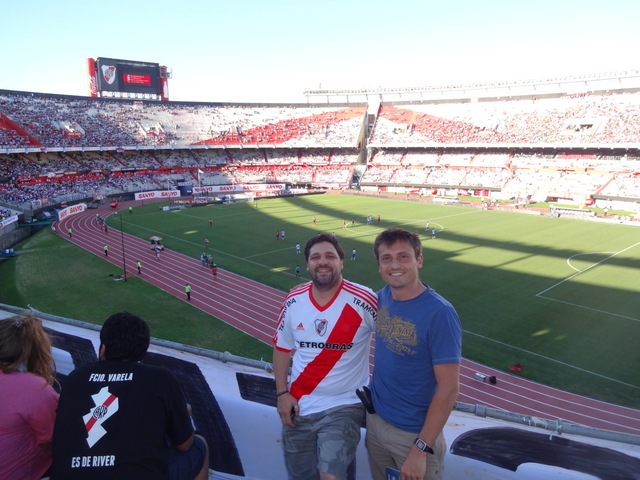 Alex, one one of the great new people we’ve met here in Argentina, is a a huge river Plate fan and being a typically generous Argentine offered to take me to the Monumental Stadium to watch River play Velez. It was a great evening. 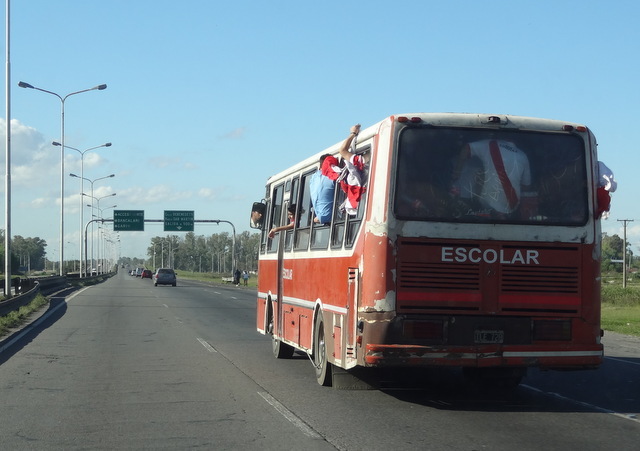 The trip in on the Pa Americana gave a flavour of the passion of the fans as they hung out of the windows of various school buses swinging their scarves and shouting and yelling at passing cars. Walking in past all the Choripan stores, being searched about three times and then fumbling over the turnstiles and then the long cimb upwards past the horrendous toilets before coming out into the huge Monumental Stadium. The football wasn’t great , probably Championship standard in the UK, but this was more than compensated by the incredible atmosphere as the singing rippled around the train and the banter between the two sets of fans intensified. 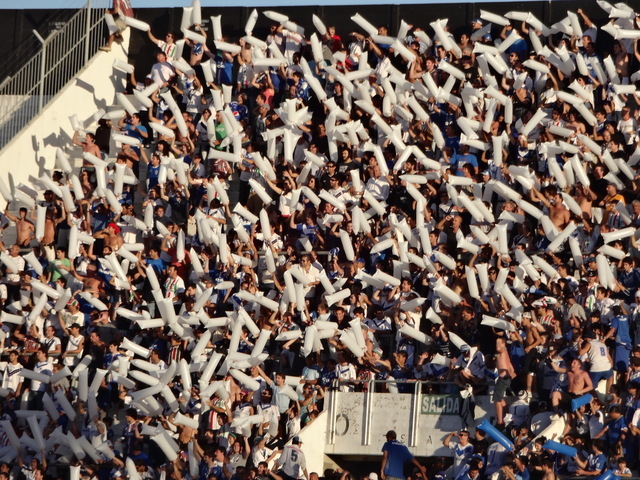 Considering how small their section was the Velez fans belted out their songs with gusto and doled out a fair amount of abuse. At one point the chant went up ‘Stand up if you hate the English’ for no apparent reason except I guess that Malvinas day is on Tuesday. I decided to keep a low profile at this point despite the fact I was wearing a suspiciously Boca coloured T-Shirt too!! The result was a boring goalless draw but this didn’t matter as I’d had a great time and it reminded me of the previous times I’d experienced Argentine football. 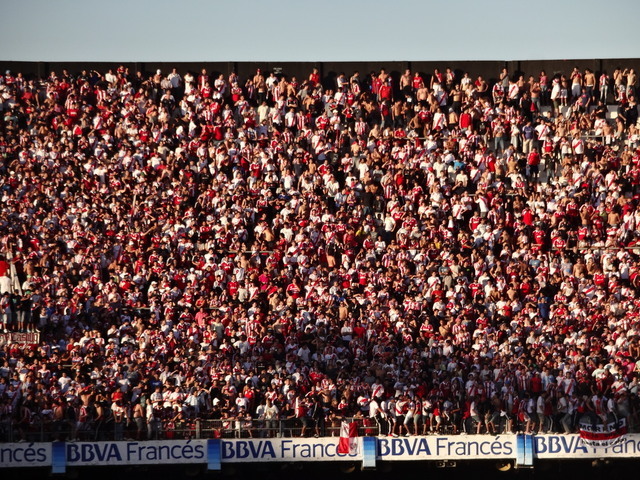 Bring on the Superclasico and I need to buy a River Plate shirt!! We’ve been in Argentina for about 6 weeks now and have had a great time so far. The people, as I remember from my last time here, have been so warm, welcoming helpful and friendly. Going out of their way to invite us to asados, driving us around the area, introducing us to people and just helping to make the whole experience of moving half way across the world so much easier. The school is a great place to work with the key part being the positive and polite students who consistently say ‘Hi Sir’, ‘Thank You Sir’ at the beginning of every lesson. The most serious disciplinary issue is making sure the top button is done up on their shirts and moving them off the school benches outside when they’re sat sunning themselves at break time after the bell’s gone. The flat is dated but a good size for us and has the additional benefit of having an entire school as a play ground in the evening and at weekends including a lovely big swimming pool, rugby pitch, sports hall and gigantic long jump sand pit! The high street is 2 blocks away and has a large Carrefour plus lots of small quirky shops which all seem to be thriving and stay open until about 8ish. Although everything is closed from about 1 to 4 which I keep forgetting. 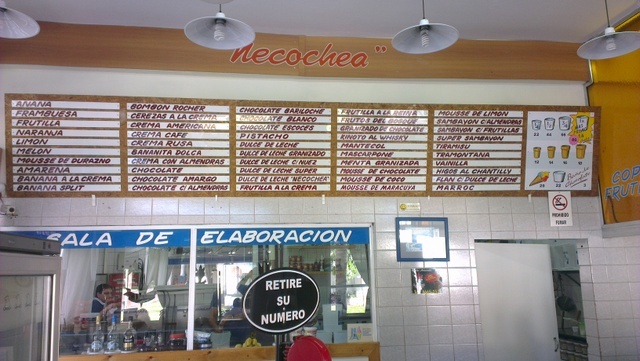 Unfortunately there isn’t a good restaurant but they’re all a short 30 peso Remis trip away (£4). As many developing countries, the traffic management system is a bit of a contradiction in terms with it basically being a bit of a free for all. Crossing the road involves looking right, left,right left, behind and in front and then double checking the red light is still on. It can also be a bit scruffy with the idea of recycling and rubbish bins something of an annoyance when there’s an entire street to drop it in. However another contradiction is the amazing tree lined avenues and streets which like the cows in India appear to be sacred and there’s no ridiculous Health and Safety officer condemning them because of the the root trip hazard. Weather is great too with lovely long fluffy white cloud days and exciting thunderstorms with lots of relampago which also involves me running around and pulling out all the plugs in the house to ensure the electrics don’t get fried. Food is great too with fresh pasta up the road, great meat as expected, dulce de leche, fresh pastries, empanadas and just about every street corner has an ice cream shop. What’s not to like! Check back again as it’s only been 6 weeks so far…!